Big Sur adapted from the novel of the same name by Jack Keouac is an unsuspecting gem by Director Michael Polish. Bringing to life Jack Keouac during his heyday as the Beatnik Renaissance man that he never wanted to be, we see his slow downward spiral in alcoholism in an unbelievably poetic fashion. Jack Keouac if you're not familiar with him wrote the book "On the Road", published in the early 50's which became a best seller and exemplified the Beat Generation according to many. The book like many of his other books including "Big Sur" is autobiographical and talks about Jack and his friends. Big Sur however differs from his other books in that the stage of life he is in is vastly different. It is a more updated self-reflection of the demons that he was going through at the time compared to the journeys through America in his earlier books. The filmmaker could not have picked a better actor to played Jack Kerouac than Jean-Marc Barr. If you look at old pictures of Jack Kerouac, the actor even shares a great resemblance to him. He does an amazing job playing Jack in the different portrayals of the mood swings from alcohol. The scene in which he explodes at his girlfriend Billie (Kate Bosworth) is the highlight of the movie for me. Besides Jean-Marc, the veteran cast overall is just amazing. 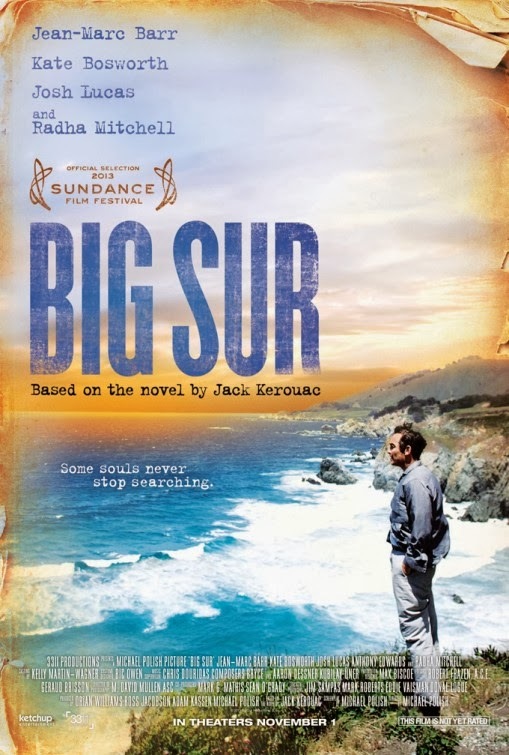 Besides the cast, the backdrop of Big Sur which is on the central coastline of California and San Francisco for which Jack frequented is a site to behold. The movie takes us back in time with set pieces including automobiles and the clothing of that era that most of us have forgotten or never knew. The pacing and filmography by Michael Polish takes a little getting used to in the beginning. But it matches the ups and downs of Jack's quite well. Overall, I would recommend this DVD to everyone. It's a bit of a somber movie in my opinion despite being a great tribute to Jack Kerouac. The movie starts off a bit slow and goes into lulls at times as we go through Jack's state of mind. However, I love the narration that is provided by Jean-Marc which often brings us back to the edge of our seats along with Polish's visuals. If you can overlook the slow pace, I believe you'll enjoy this dark look into one of America's lost literary icons. The DVD has little as far as extras besides the original trailers. It is out on January 14, 2014 and can be purchase here on Amazon.